Today’s article is the eleventh in a series of articles (1st Steve Jobs, 2nd Michael Dell, 3rd Warren Buffet, 4th Bill Gates, 5th Larry Ellison, 6th Eric Schmidt, 7th CIOs and the ideal management style, 8th Louis V Gerstner, 9th late Steve Jobs and Tim Cook’s, and Richard Branson), analysing current and past leaders to ascertain how senior management including Chief Information Officer’s (CIOs) can learn better management by applying the management practices of leadership, practiced by these leaders. Sergio Marchionne (mar-key-OWN-ee) also won the 2011 Deming Cup (and other accolades) and regular readers will know that I am a big Deming fan and as such, I really wanted to find out more…. The sign of a true leader is that he not only inspires and motivates but ensures that he is surrounded by the best talent, especially in the areas where he doesn’t excel. Sergio does this brilliantly by promoting the best talent and allowing them make their own decisions, coupled with clear, achievable targets. As an accountant he knows his figures and utilises that aspect to his advantage. Senior managers need to understand the importance of retaining and investing in people as displayed by Sergio. One of the reasons for Sergio’s success is that he is constantly analysing his businesses to find out how further improvements can be made. He expects his managers to have their finger on the pulse of the business and failure is NOT an option. According to European CEO, “We spit blood to clean up and restart Fiat. 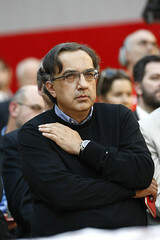 When I took over, there was a smell of death here,” Marchionne has said of the experience. Marchionne refused to get bogged down in the engineering technicalities of running a car manufacturer. He took a more philosophical approach and modelled sales of the Fiat 500 on the iPod – when it broke into the UK’s top 10 selling vehicles in 2009, it became the car people didn’t think twice about buying. It became the iPod on wheels – practical, stylish and affordable. Sergio was a big fan of Steve Jobs and used his philosophy with great effect in selling the Fiat 500. The Fiat 500 has not done so well in USA and it remains to be seen whether he can launch more cars akin to the iPod! Certainly, like Steve Jobs, he needs to create an environment and culture that thrives on spotting opportunities. When profits are dwindling and an organisation is on the brink of producing losses, serious questions have to be asked of its management. Sergio, was quite right to question his management team and change the structure based to a performance related one (Based on meritocracy, as Deming envisaged). Something has to change, as in that situation if nothing changes, the organisation will cease to exist! “I don’t think that people really understand what the implications would have been of a lack of decisiveness at that point in time,” says Marchionne. “It would have been a mess.”(Referring to the purchase of Chrysler) – SM- Time Mag –America24-. Chrysler was on the verge of bankruptcy and decisions had to be made. Sergio did not shy away from such decisions and followed his instinct, just as Steve Jobs did (Sergio is a fan). The secret is to learn from your mistakes, put them behind you and move on. According to Money CNN, “Marchionne believes his competitive advantage is speed. By wiping out layers of management and making decisions more quickly, he’ll get closer to the market and bring out new models faster than his slower-moving rivals. “They have access to me 24/7,” he says, and when they call or e-mail, he makes decisions in minutes — or seconds. While traveling, he stays in contact with one of his six BlackBerrys. “BlackBerrys are divine instruments,” he purrs. Sergio, clearly knows his own competitive advantage and he uses that with great effect for the benefit of his company. While other CEOs may reply to such emails a day or two later, he almost communicates with them in ‘real time.’ This allows the business to be very agile in terms of making crucial decisions. I covered this in my post, Leveraging IT for Competitive Advantage – Myth or Reality? Senior management need to focus on the core activities of a business and shy away from getting involved in M&A’s that do not contribute or add value to that core perspective. In the car industry, failures have occurred when businesses have not produced cars that the public want to buy with features/quality that the public want to buy. Shy away from the projects that do not add value to the business but may just be a ‘nice have’ or appear to add value. Learn to say, ‘No’. “What I look for in people is the ability to use that space intelligently, not to abuse the freedom,” he says. “It’s to remain absolutely focused on the objective but not to define the method of execution.”-SM – Time Mag –America24-. Sergio did not have to buy Chrysler but he had the conviction that he could turn it around as he could innovate and launch cars that the public really wanted to buy. Some will inevitably fail but many will be huge successes. Many businesses lack of innovation is due to their fear of failures. Prior to negotiating with the US administration, Sergio had already turned Fiat around and as such held the respect of Obama and his team and their belief that he could turn the ailing giant around. Unfortunately, such ‘respect’ can only be earned. Sergio will drop references to his numbers but will not get carried away with them and only uses them ‘sparingly’ so that he can make convincing arguments while avoiding the detail. Sergio wanted to break down the barriers between senior Management and employees and the ideal way to do this was to be closer to the action, i.e. the engineering department where cars were ‘visualised’ and eventually made. This is a trait in common with other leaders, such as Bill Gates. Sergio, surrounds himself with smart people and ensures that when they present their information, they have investigated it thoroughly. Questioning the assumptions that they may have made, ensures that such information is ‘de-risked’ and provides a sound foundation for them to make progress.